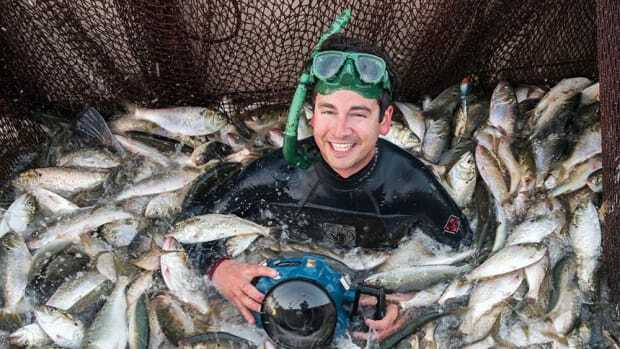 Mike Muessel grew up on Lake Superior in Duluth, Minnesota, the son of a career Coast Guard warrant officer. 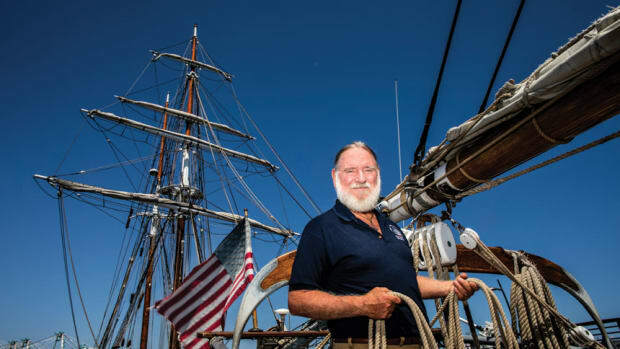 His family owned a 26- foot wooden launch and a 25-foot wooden sailboat that received heavy use. They moved to Kodiak, Alaska, for a time before landing in Newport, Rhode Island, in 1963. 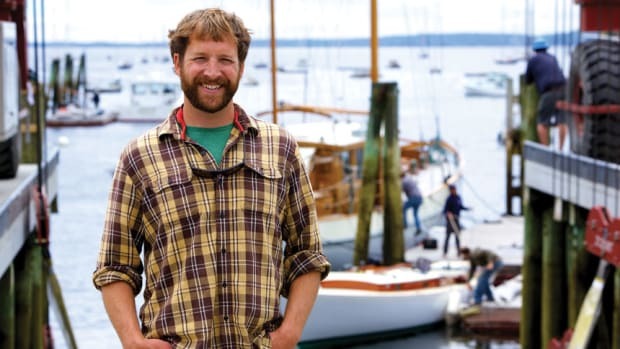 After graduating from Boston’s Northeastern University, Muessel sought to satisfy his nautical wanderlust by sailing and traveling the world. His adventures took him to the Caribbean, the United Kingdom and Afghanistan. On his return, Muessel teamed up with friend Ron Ackman to skipper boat deliveries up and down the East Coast. The pair formed Oldport Marine Service in 1972 to provide mooring services in Newport. They bought Newport Launch Service in 1975 and by the early ’80s realized the three launches they were using to ferry people to and from shore were woefully inadequate. 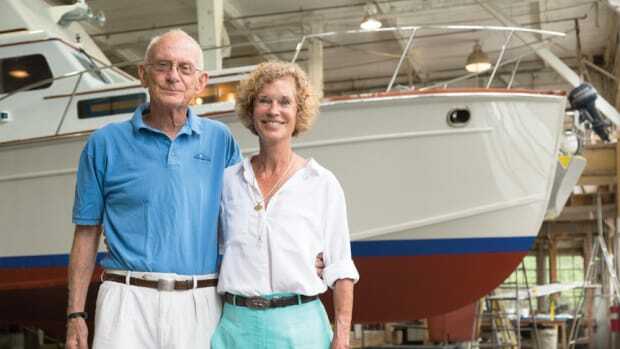 They rescued an abandoned mold for a 26-foot launch and in 1984 splashed the first Oldport 26. More than 140 boats later, the Oldport 26 is well-respected as a workboat that’s easy to drive, efficient and capable of safely ferrying a load of people. 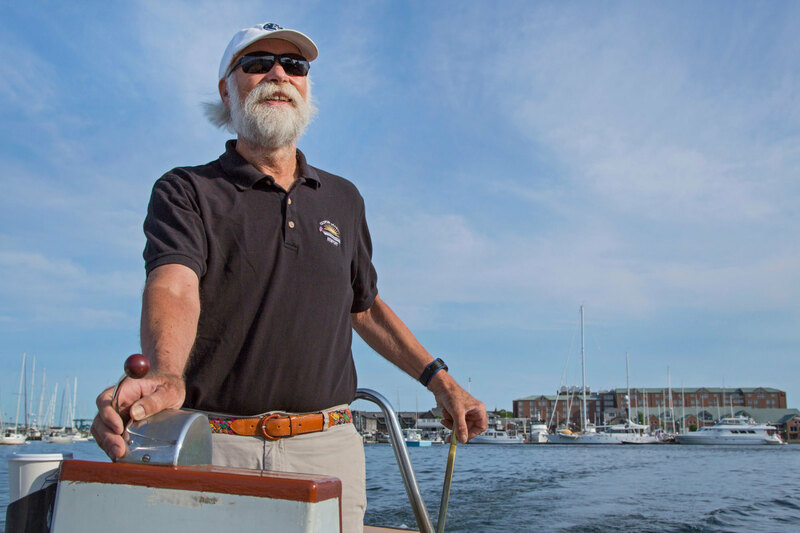 Oldport Marine continues to thrive, with Rhode Island mooring operations in Block Island and Newport, as well as Edgartown, Massachusetts. The business employs 70 people and 20 signature Oldport launches. 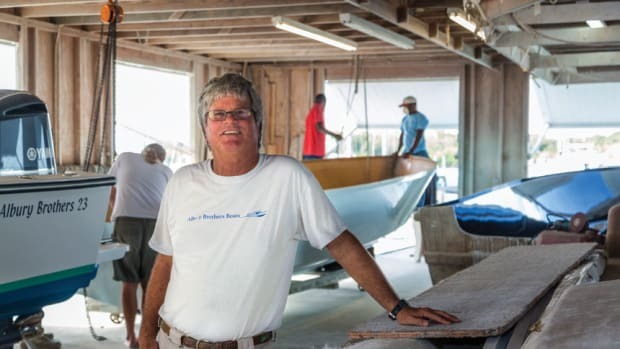 The boatbuilding side of Muessel’s business completes two launches a year. The boats are widely used by businesses along the East Coast. First memory of being on a boat: I was 3 years old and traveling on a 26-foot wooden launch 20 miles out into Lake Superior, where my father was the keeper at Rock of Ages Light. 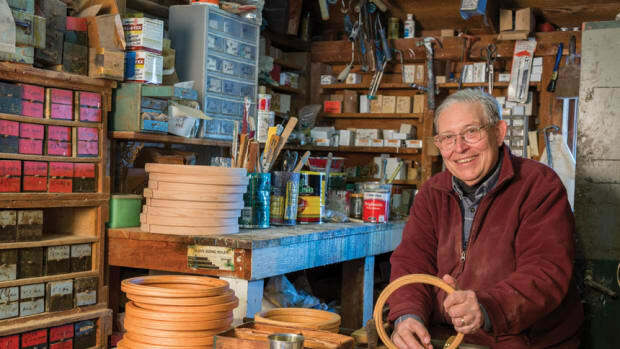 He had fixed up a fisherman’s cabin on a nearby island, where we spent summers. We kept a skiff named the Otto B Sunk at the lighthouse and a 25-foot wooden sloop in Duluth that we sailed frequently. When we moved to Alaska, my dad traded it for a mink coat for my mother. 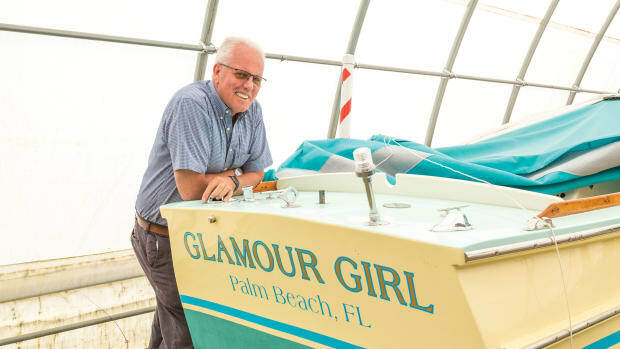 First boat you owned: When we moved to Newport in 1963, we acquired a 15-foot Falcon sloop that we named Donation. She was given to my brother and me by friends. My dad was the commanding officer at Castle Hill Coast Guard Station at the time, and he arranged for dockage in the basin at the north end of Fort Adams in Newport. The fort was abandoned and closed to the public at the time, but we teenagers had a key to the gate and the run of the place, but that’s another story! Current boat: A totally restored and repowered 1959 Huckins Sportsman 40. She cruises at 20 knots and will do 28 knots wide open. Favorite boat you’ve owned: Our present boat, Sashay, which like all Huckins is fast, seaworthy, comfortable and good-looking. Your dream boat: My next boat! She’ll be my fourth Huckins, a 1965 Atlantic 53 in need of a bit of sprucing up — i.e. another restoration project! Most rewarding sailing experience: Winning the 1992 Classic Yacht Regatta in our 1950 50-foot Henry Gruberdesigned, Burmeister-built wooden cutter. We won not only Class A, but also best elapsed time and best corrected time in a fleet of 80 boats. We proudly lashed an inverted broom to the forestay, signifying a clean sweep. Scariest adventure aboard: Our maiden voyage with our 2-year-old son heading home from Block Island in our freshly restored 34-foot Huckins in heavy seas. The fuel was sloshing around in the tank, which caused the junk in it to plug the fuel lines leading to the fuel filters. We had to shoot the gap in the Point Judith breakwater with large following seas and engines that kept dying, but we made it. We were in the midst of potty training, and when we asked Will how a wet diaper felt, he said, “It feels like a fuel filter!" Most memorable experience aboard: A trans-Atlantic delivery from Newport to Cowes in 1971. The boat was a 1927 110-foot Camper and Nicholsons gaff-rigged ketch named Cynara. The trip was the beginning of a nine-month odyssey that got me all the way to Afghanistan and back, all on $1,000. I had five bucks in my pocket when I returned. The best part was having a formal dinner on board when we reached the halfway point of the delivery. We dressed in the best clothes we had, including ties, and sat down to a wonderful meal. Longest time you’ve spent at sea: Twenty-two days sailing trans-Atlantic on Cynara. Favorite destination so far: I have two: Bequia, in the Grenadines, and my tent, at 11,000 feet in the Rocky Mountains while hunting elk after a busy season on the water. Favorite nautical book: Nigel Calders’ Boatowner’s Mechanical and Electrical Manual. I do enjoy reading for entertainment, but I have a thirst for knowledge, and this book is full of it. 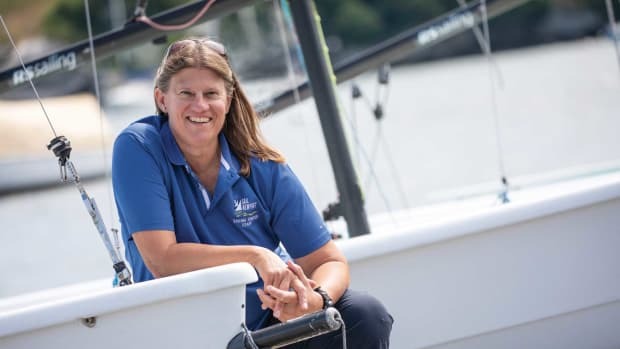 Most rewarding professional experience: I love following the careers of our former launch operators who have gone on to be Volvo Ocean Race sailors, America’s Cup sailors, doctors, businessmen, lawyers, captains and generally good citizens.